Ultimate Music Theory Advanced Rudiments Workbook and the Ultimate Music Theory Answer Book. In Advanced Music Theory Rudiments, students learn how to identify the relationship of a motive (a musical idea or a phrase) to another motive. This relationship will be defined as a Sequence, an Imitation or an Inversion. Understanding Sequence, Imitation and Inversion can be tricky, so here are some UMT Tips to help your students (and you!) "get this" concept! be played or sung in the same voice or clef. be played or sung at a different pitch - either higher or lower. If the motive is repeated at the same pitch (using the same notes in the same voice or clef), it is a Repetition and not a Sequence. If the motive is repeated at a different pitch but in a different voice or clef (for example, it is stated in the Treble and then restated in the Bass), it is an Imitation and not a Sequence. Yes - a bit corny, but students will "hear" how the sequence is just sung higher or lower in the same clef - so they will "get it"! be repeated in at least 2 different voices or clefs or instruments. be repeated at the same pitch or a different pitch in the 2nd voice, clef or instrument. If the motive is repeated at the same pitch in the same clef (or voice or instrument), it is a Repetition and not an Imitation. If the motive is repeated at a different pitch but is still in the same clef (or voice or instrument), it is a Sequence and not an Imitation. To be an Imitation requires there to be at least two different instruments, voices or clef signs! To help my students understand Imitation, I like to play the Imitation Game - I ask them to "imitate" me by repeating what I sing or say. It doesn't matter if they are at the same pitch or at a different pitch - simply because there are two of us repeating the same "motive", it is an Imitation. Imitation always involves at least 2 different voices, clefs or instruments - the initial "statement" by one voice, clef or instrument and then the imitation by a different voice, clef or instrument! be repeated upside-down in the same voice, clef or instrument or in a different voice, clef or instrument. keep the same pattern of intervals and rhythm, just switch the direction (up becomes down and down becomes up). If the motive is repeated using a different rhythm or different note values, it is not an Inversion. Play the Inversion Game with your students - hum a simple melody and have them hum it back but in the opposite direction. If they don't like to sing (or hum), then stand up and have them copy what you do, but in the opposite direction. Start with both your arms straight out in front of you. If you move your right arm up, they do the opposite and move their right arm down. If you take two steps back, they do the opposite and take two steps forward. Have fun seeing what body movements you can invert! Sequence, Imitation and Inversion - Pop Quiz! Now that you are a pro at identifying the difference between Sequence, Imitation and Inversion, it's time to take this Pop Quiz. 1) Identify the relationship between the motives in Measure 1 and Measure 2. 2) Identify the relationship between the motives in Measure 3 and Measure 4. 3) Identify the relationship between the motives in Measure 5 and Measure 6. Before I give you the answers, I just want to remind you that the Complete Rudiments Workbook is now available as an Online Course in the Complete Music Theory Course. The Complete Music Theory Course is for students or for teachers - this is an excellent resource to review your theory foundation. For more information, click here! For students who do not have access to private or group theory classes, the Complete Music Theory Course is an excellent way to prepare for the Advanced Rudiments Theory Examination through the Royal Conservatory of Music. If you have any tips that you use with your students, please share them with us! PS - Thank you Sharon Wiebe UMTC for requesting this blog on Sequence, Imitation and Inversion. 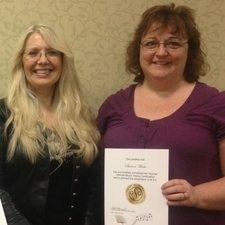 Sharon is a graduate of our Live Ultimate Music Theory Certification Course. 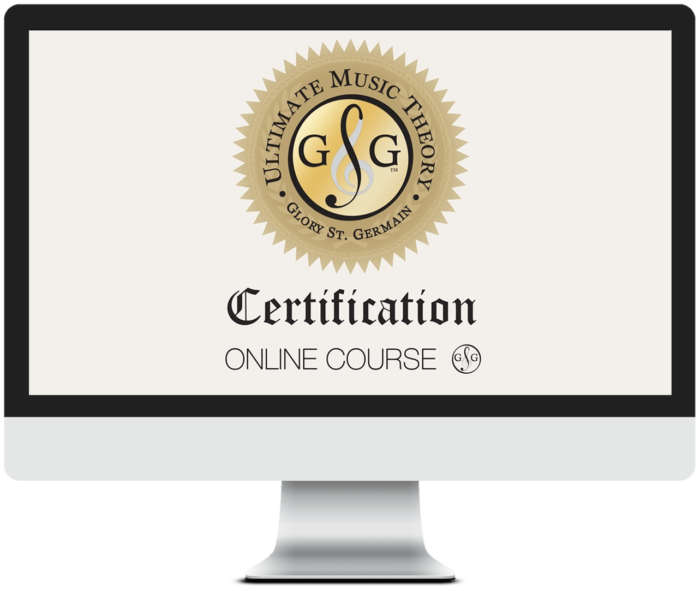 If you would like information about becoming a Certified Ultimate Music Theory Teacher, please click here! AND Teachers - if there is a concept that you need just a little bit "more" to help your students get it, please do not hesitate to email me! Wow, Shelagh! This is a very helpful blog on compositional techniques! I was taught the concepts of repetition and sequence, but if either motive was repeated exactly in the other clef, I was told this was an octave shift. Is this technique only applicable if you repeat the motive an octave higher or lower in the SAME CLEF? Or are all of these imitations, making octave shift not a true compositional technique? In this level of Rudimental Theory, students only need to know the basic techniques of repetition, imitation, sequence and inversion. Each technique has lots of layers for analysis. So, yes, an octave shift is a compositional technique however it need only be identified as imitation as it is a form of imitating at a higher or lower pitch. As students learn more about composition, they can be more specific in their technique naming! Hope this helps.